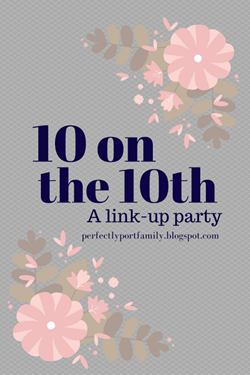 This month’s topic for 10 on the 10th with Perfectly Port is 10 Things I’ve Always Wanted to Do / Try, which sounds like a great excuse to post a bucket list! A very cool website I recently came across is called My Bucket List Journey and on it the writer has a list of over 800 Bucket List Items she wants to complete – and many she has already completed! I have been meaning to write my own bucket list and this post prompt is a good way to get that started. I’ve also created a few bonus lists! 1. Be present for a baby’s birth – not via c-section. This is something I have never been able to experience myself. (Read more about that here). 2. Visit all 50 states. The ones I have left are: Oregon, Idaho, Montana, North Dakota, Utah, New Mexico, and Louisiana. 4. Attend an Olympics event. 5. Visit the Redwood Forest. 7. Stay in a private bungalow on the water somewhere tropical. 8. Organize and participate in a progressive dinner. 9. Stand in 4 states at once. 10. Cheer on runners at a marathon. 3. Do an Escape Room. 5. Do a ropes course / zip line. 6. Get a makeover and have photos taken. 7. Ride a beach bike on the beach. 8. Participate in a pay-it-forward in the Starbucks Drive-Through line. 9. Take a trip with each of my kids individually. 3. Attend a high school reunion. 4. Be on a reality show. 5. Sing Karaoke in public. 9. Do a polar bear plunge. 1. Crawl through a cave. 2. Rappel down a cliff. 5. Complete a 1/2 marathon. 6. Research my family history. 7. Visit the Egyptian pyramids. 9. See a Broadway Show. Have you done or tried any of these things? Do you want to? Previous Post Zachary Is 10!